Let us delight you with a 100% vegan recipe of Seitan Lasagna. Creamy taste and rich flavour distinguish our product compared to many others around. Thin layers of fresh semolina pasta eggs free are hand made by a Company which uses traditional recipes and high quality stone milled flours. ​Tomatoes used in the filling are 100% italian and the bechamel is 50% made with Vegan Spreadable Classic which gives its creaminess and flavour. The Seitan we use is 100% Bio from italian wheat. Flours are not just premixed, but are washed just before the preparation occurs. Keep in the freezer between -18° C e -6°C. 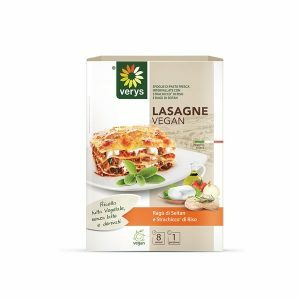 discover LASAGNa with seitan RAGÙ and STRACHICCO! Bechamel: (BioSurice > water, germinated whole rice 20,8%, salt, apple vinegar), coconut oil, Kamut flour, Iodine salt, nutmeg, Seitan stuffing 38%: tomato pulp, seitan (wheat flour soft type ‘O’, water, soy sauce (water, soy, whole hard wheat, sea salt), ginger, carrot, onion, white wine, extra virgin olive oil, iodine salt. Strachicco 12%: (BioSurice > water, germinated whole rice 20,8%, salt, apple vinegar),water, coconut oil, rice syrup, lemon juice. Thickening agents: agar-agar, arabic gum, xanthan gum, carob tree seeds flour, natural flavour. Preparation Traditional Oven: unwrap and place Lasagne in a ceramic plate or similar container. Pre- heat oven at 200°C and place the vegan Lasagne in for 8 minutes.